A. The intelligent allocation of limited resources. B. Distributing resources across all potential growth opportunities. C. Working to be better and faster than the competition. A. Being better than the competition. C. Providing differentiated value to customers. A. People, strategy and process. B. Customer focus, service and product leadership. C. Acumen, allocation and action. A. The current purpose of the organization. B. The general outcome you’re trying to achieve. C. The specific outcome you’re trying to achieve. A. The specific outcome you’re trying to achieve. B. The future purpose of the organization. C. The general outcome you’re trying to achieve. A. How you will achieve your mission and vision. B. What you are trying to achieve. C. The tactical means of achieving business success. A. How you will achieve your goals and objectives. B. Long and short term goals. C. A balanced scorecard indicating business performance. A. Annual process for creating a strategic plan. B. The ability to generate business insights on a continual basis. C. Using SWOT Analysis to identify opportunities and threats. A. Tactics as it does goals and objectives. B. The economy as it does on your core competencies. C. What you choose not to do as it does on what you choose to do. A. Not be all things to all people. B. Serve as many customers as possible. C. Develop an exit strategy for the business. 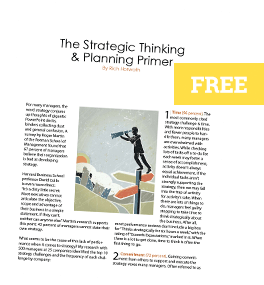 There’s a big difference between using the word strategy and being strategic. So how strategic is your group?